Friday, December 1, come down to the Twin Lakes Tasting Room and help benefit a great cause! We will have live music, finger foods, and a silent auction in our Tasting Room located in Newport, Delaware. For every beer sold from 4-9pm, Twin Lakes will donate $1 to the Wilmington Flower Market. 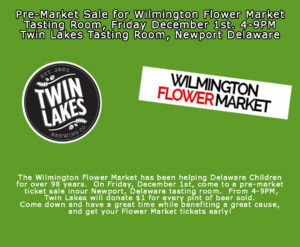 The Wilmington Flower Market is a 100% non-profit that has been dedicated to raising money for Delaware children for the last 98 years. They definitely need all the help they can get, and we’re happy to host this event and do everything we can. But we can’t do it alone! That’s why we’re calling out to the community to come out and show your support. It’s going to be a great time, and you’ll feel great knowing you’re helping benefit the people around you. This entry was posted in Tasting Room Event on December 1, 2017 by Edward Poore.